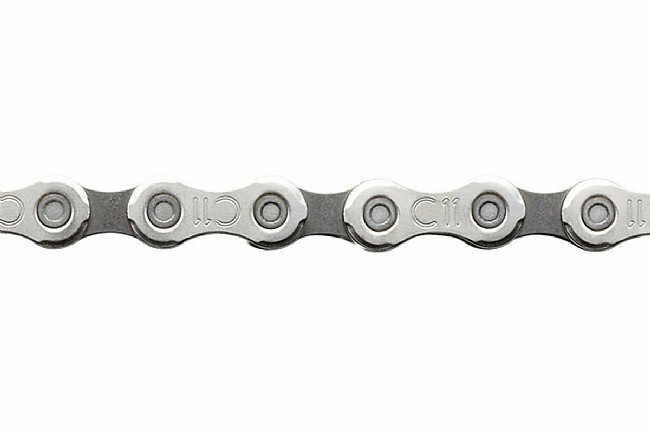 All the great features of the Record 11 speed chain without the hollow pins. The 2011 Chorus chain's Ultra-shift contours mesh perfectly with Campy's 11-speed chainrings and cassette sprockets. Despite how narrow and light the chain is, Campy claims it is their strongest yet. This is due to a stronger outer link material, Ultra Link construction and Ni-PTFE anti-friction treatment. Compatible with Campagnolo 11-speed drivetrains only. 5.5mm width. 256 grams (114 links; 2.24 grams per link). Note: Use of the UT-CN300 11 Speed Chain Tool is required for installation and removal. SAME OLD CAMPAGNOLO TRIEDTRUE PRODUCT AT GREAT PRICE! The same reliable Campy product at great Bike Tires Direct pricing! I thought I needed a backup chain, and the price from Bike Tires Direct made it possible at a price reasonable to do so. It feels great to be pro-active, and ahead of the game.